I can sing almost as good as Briar Rose (Princess Aurora, but that's not who she thinks she is when she sings). It's amazing what singing 'Once upon a dream,' over and over again can do for your voice. No, you will not hear me do any singing. You will just have to take my one year old's word for how good I am... actually she can't speak english yet, so you'll just have to trust me on this; her eyes light up and cuddles sink into me as I sing and I just know I'm doing a pretty dang near pitch-perfect job. I'm ha-larious. Even a look or a sudden unintentional movement can give my daughter laughs for miles. She squeals giggles at all my facial expressions, touches, jokes, footsteps... I'm pretty well just one great big bundle of humour. I can change diapers without dry-heaving. Seriously, it was sooooo hard for me to change diapers before having my own baby. Honestly having your own child is COMPLETELY different. I haven't had 1 moments trouble with diaper changing my little one... Except in the hospital when I first had her... I literally kept forgetting to change her, I was just so busy feeding and snuggling her. Pretty sure some of the nurses were a little concerned with my mothering skills as they changed her 9/10 times. Don't worry though, I got it together when I got her home and child services were called off thank goodness! 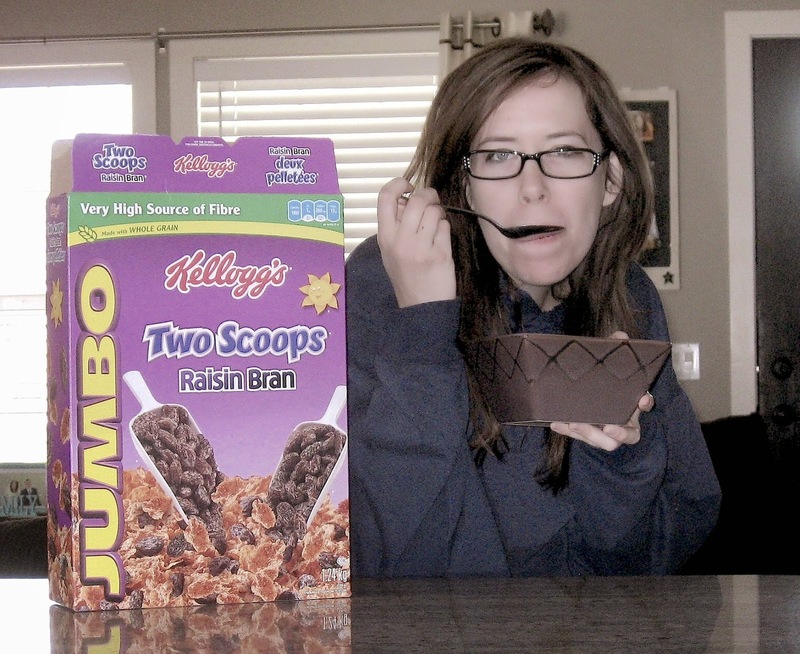 My favourite cereal is Raison Bran. Weird right? I used to LOVE fruit loops and all the yummy goodness of sugary breakfast cereals, but now I HATE them all with a passion. They've tried to kill me too many times this past year, but not my dear Raison Bran. It kicks off a delight to my morning that I can't fully describe; It's just such a comfort to know that I can eat something that I know for a surety will not cause me any horrible pains later on. (pains far worse than my labor ever was). I like having my house tidy. Not that I didn't before, but having messy spaces didn't bother me the way it does now. Having a tidy/clean house was always kinda my hubby's thing, but now it's kinda mine too. I make the bed almost every single day - this did not happen a year ago. Being without a dishwasher for the past 7 years has really made me so grateful for having one that my dishes are constantly being done... of course having a very open concept house kinda forces you to keep your kitchen clean since it's in every door knocker's view. I won't be having anymore house pets. I had always dreamed of having an indoor pet cat as my parents never allowed it growing up. A year after we got married we got a kitten who grew into a cat in our last house we used to rent before baby. Anyhoo, with a new baby plus our first home purchase came new furniture and it was just going to be a nightmare watching over our cat with it all, so we sent him to live with fellow cats at my parent's place. Honestly, we really did love our Jettstofur, but not having cat hair everywhere, sratched to heck furniture, litter box management, and food under lock and key has been a-m-a-z-i-n-g. If we lived in the country we'd for sure have outside pets, but it's been glorious not having an animal in our house full-time. I can get rid of my clothes. I'm not a hoarder, I'm a chucker, except when it comes to my clothes. Though, due to this past year having limited closet space and an attitude adjustment, I've gotten rid of quite a few clothes guilt-free! It also has to do with seeing my nieces wearing them and looking way cuter than I ever did in them. I also started really cracking down on hardly buying anything new. It's always felt good to get rid of stuff for me as I hate clutter. Having lots of stuff always makes me feel all panicky like I have to try to save all of it if a flood happens or I have to pack all this stuff up if we ever have to hastily move (ahh!). But, I've started to adapt this panic into my clothes hoarding ways, small steps of course, but it's getting there! I realize that #1- 3 are true to most all mommies, but does it make it any less incredible to be loved this much?! Heaven's slice is self discovery.